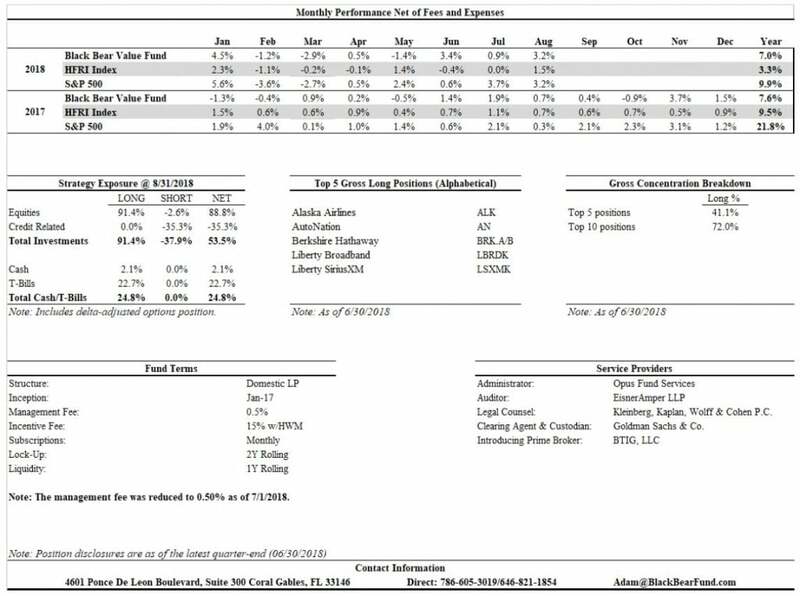 Black Bear Value Fund commentary for the month ended August 31, 2018. The Black Bear Value Fund returned approximately 3.2% net in August bringing the 2018 net return to 7.0%. The S&P 500 returned 3.2% in August bringing the 2018 return to 9.9%. The HFRI index returned 1.5% in August bringing the 2018 net return to 3.3%. As I have mentioned in prior emails, the S&P 500 is an imperfect comparison and getting more imperfect for our portfolio as time goes on. Our portfolio has increasingly less overlap. We have investments in foreign countries, in non-indexed companies, in cash and a large short credit position. However, as you have the alternative to invest in the S&P 500 it's performance is still a relevant benchmark. It was suggested to me that I provide some comparisons to other funds. After some thought, I decided to include the HFRI multi-strategy index and will provide that data point going forward. The timing of your investment could result in different returns so please consult your statement. Statements should be arriving from the fund administrator shortly. The Fund is managed by Adam Schwartz who has 16 years of buy-side investment experience in a variety of themes including equities, structured products, corporate credit and capital structure arbitrage. Prior to founding the Investment Manager, Adam served as a Director and senior member of the investment team at Fir Tree Partners, a $13BB peak-AUM multi-strategy investment manager (2007-2015). Prior to joining Fir Tree, Adam was an Investment Analyst at LibertyView Capital Management, a multi-strategy investment fund within Lehman Brothers, as well as at Kore Advisors, an investment fund seeded by Paloma Partners. Adam received his BS and MS with a concentration in Accounting from Washington University in St. Louis in 2001/2002.